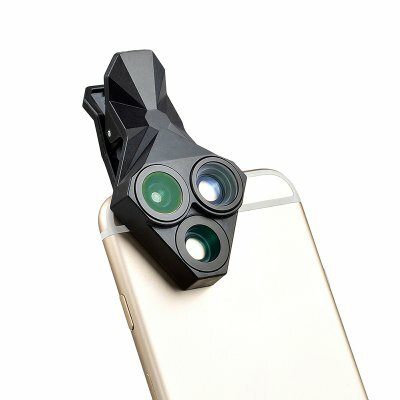 Successfully Added APEXEL 3 in 1 Smartphone Lens Kit - Fisheye Lens, Macro Lens, Wide Angle Lens, iOS and Android Fit to your Shopping Cart. This 3 in 1 smartphone lens kit makes smartphone photography even better, Get close up shots with the macro lens, capture great landscapes with the wide angle lens or play with shots using the fisheye lens to get nice and interesting takes on the mundane. The kit comes with a 0.63X wide angle lens, a 190-degree fisheye lens, and a 20X Zoom macro lens. The 3-in-1 smartphone lens kit comes with 12 months warranty. Brought to you by the leader in electronic devices as well as wholesale smartphone lens kits and mobile accessories.